With the update deadline approaching (July 12th, 2013) I wanted provide a little extra help in updating to those who might want it. 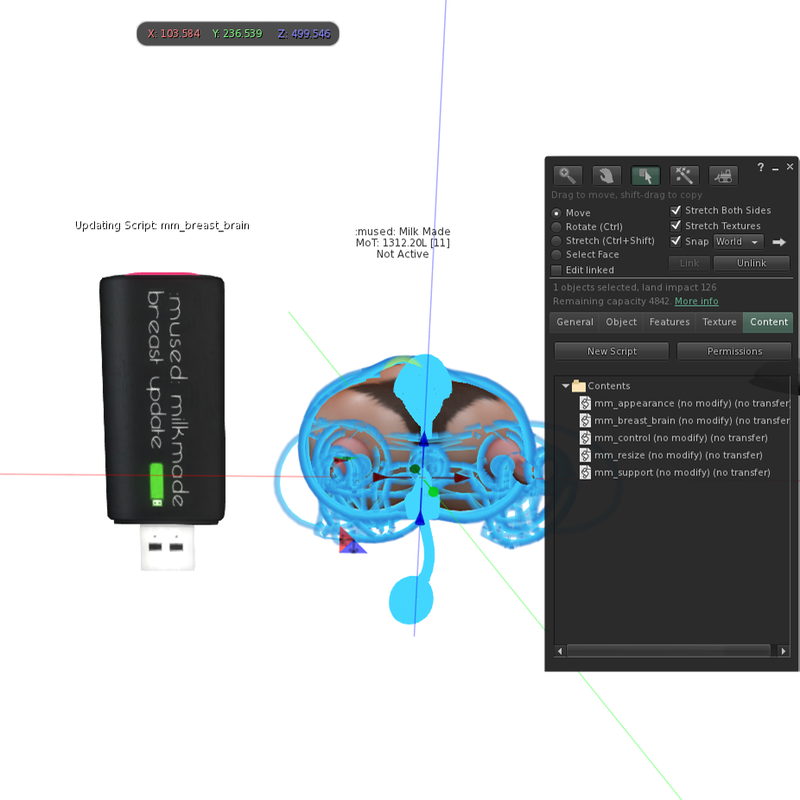 First of all you can use the v1.30 that are in the box and resize and change the appearance if you would prefer rather than updating an older pair of breasts. However if you have one or more that you would rather just update the scripts on instead of resetting up the appearance here is how to do it. 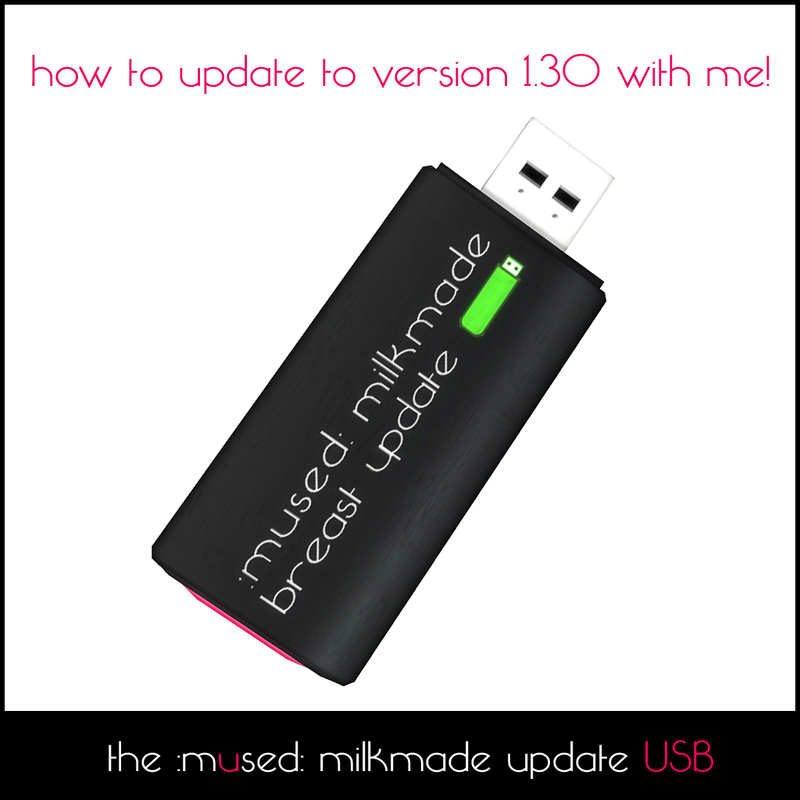 Step two: unpack your update box and find me (the :mused: Milk Made Breast Update (USB) ) and then rez me! You can also wear me if you want to I don’t mind being held. When I am rezed I will give you a script. (It will go into your script folder in your inventory.) This script will let me talk to your breasts and update the rest of the scripts in them. Step three: Rez a copy of the breasts you want to update, but make sure to keep me out! I need to be there to do the updating for you. Step four: Edit the breasts and put the script I gave you into the content window. They will say this in local chat to let you know we are working. Step five: Sit back and relax while I update the scripts in your breasts I will let you know what I am doing in both my float text and in local chat. 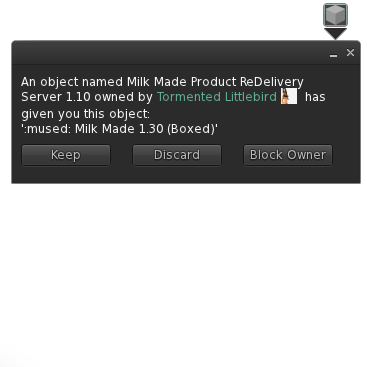 :mused: Milk Made Breasts v1.2: **Xcite! Partner v2.0.3 initialized : 7094 bytes free. Step six: Now I am done! 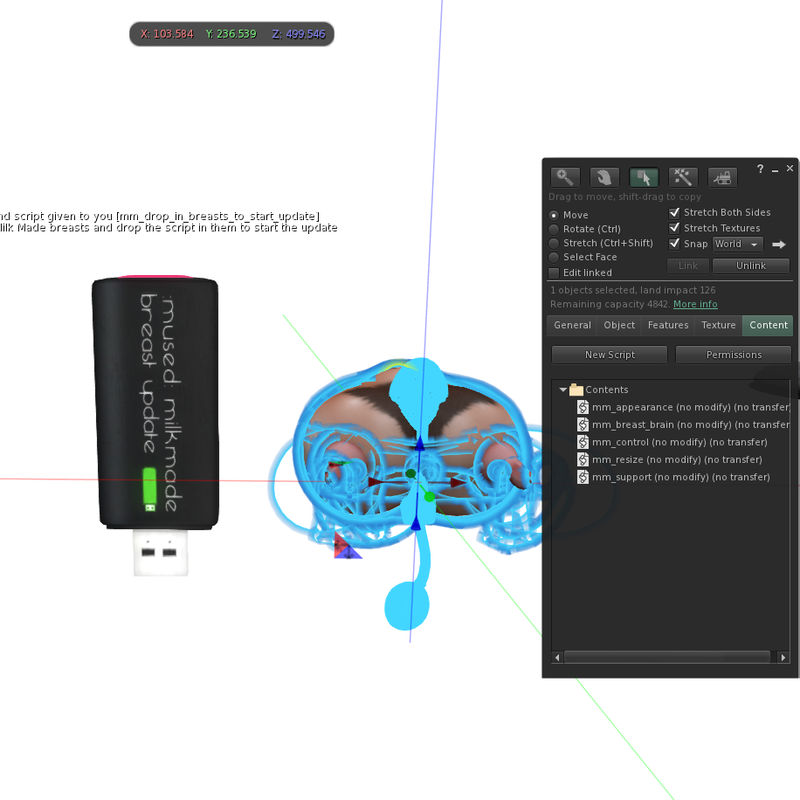 You can see I updated the scripts because I have added the new script for the xcite! features. Step seven: I know a lot of people like to rename their breasts so they know what outfit or avatar they have it set up for so I did not change the name of the breasts but I did change the description so you can leave them as they are or change the name of them so you remember they were updated. Step eight: You can now take your breasts back into your inventory and are done or you can use me to update another pair of the breasts for you! And don’t worry if you don’t get all your breasts updated at once I can help you out whenever you need me to!